Authored by: Barbara A. 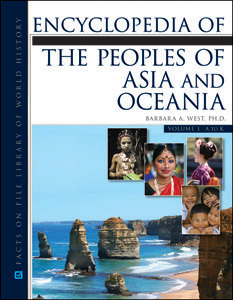 West, Ph.D.
Encyclopedia of the Peoples of Asia and Oceania is a two-volume A-to-Z reference to the peoples of the Asia-Pacific region east of the Caspian Sea, not including the countries of the Middle East. More than 400 entries cover the major peoples that for a time maintained a cultural identity in the area—from ancient to modern times—describing their history, migration, culture, belief system, social organization, and relationship to other peoples. This accessible resource makes it easy for students to find not only entries on the Han and Jurchens but also on "Chinese: nationality," describing who they are today with cross-references to the various ancestral peoples. Entries on all large or well-known groups include information on their geography, origins, languages, history, and culture. Subsections cover such topics as subsistence, religion, social and political structures, economy, government, military practices, dwellings and architecture, clothing, transportation, technology, art, music, and literature. The back matter includes a chronology, bibliography, and comprehensive index, as well as several appendixes with useful background information on topics such as kinship systems, religious systems, and subsistence systems. "A set this comprehensive, providing so many access points and excellent appendixes, epitomizes the very best in introductory subject encyclopedias...highly recommended for community-college and large public library collections." "...a nice addition to a high school library's reference section. Recommended." "The organization and level of detail in this work are not duplicated elsewhere...Highly recommended for academic and large public libraries."